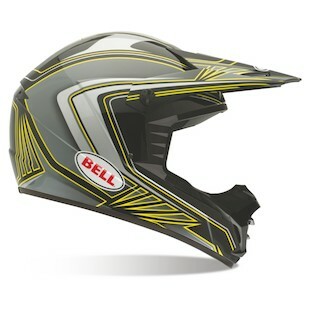 Bringing up the rear, the SX-1 is the entry-level dirt helmet from Bell Helmets. Their new graphics for Fall 2013 should make waves with their colorful paint and progressive look. Your best chance of breaking the sound barrier is with high-octane fuel, WOT, while wearing a Bell SX-1 Sonic Helmet. Experiment with the Doppler effect and leave your fans in the wake of your sound wave. The singular Black/Yellow/Grey colorway is both high-contrast and high impact, at least in the sense that it will leave an impression on the competition as you pass them by. "Brrra-a-a-p" never looked so good. 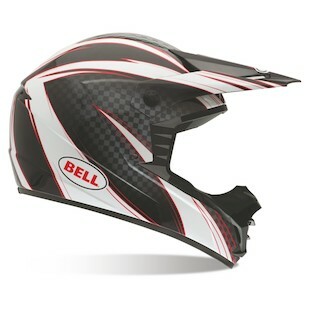 There are many types of reactions, and you can have your pick with the Bell SX-1 Reactor Helmet! Bioreactor, chemical reactor, nuclear reactor, no matter the type, the results are the same with this lid. A bold Black/White/Red reveals clean lines and a checkered finish. Brush up on your physics -- Unstoppable force meets immovable object. Boom! React. So what will you have? What instrument will you wield to carve a motorcycle-shaped rift through the dirt? Go big. Go Bell. Make waves.